After a week of travel I arrived to Valencia and parked my car to the garage of Russafa market. Me and my dog had taken a ferry from Helsinki to Germany and then driven through Europe to finally look for a bar in Russafa, where I was supposed to meet my couch-surfing host for the first week or so. The apartment turned out to be a beautiful, renovated “atico” – a penthouse which you can find a lot in Valencia. I had been to Valencia briefly once before, a year ago between Christmas and New Year. I didn’t immediately fall in love with it. In fact, my first thought was that all the streets and crossings look exactly alike. It didn’t seem to have the truly Spanish charm of Madrid or Seville, but it had something else. In those three days I only scratched the surface of Valencia and continued my trip to Granada, but I took something with me: A thought, which in the following months began to grow and grow. Perfect size, affordable, nice climate, beach and nature.. maybe it could be a good place to live in? I have to admit I still hadn’t done much research on Valencia before I came here for the second time. 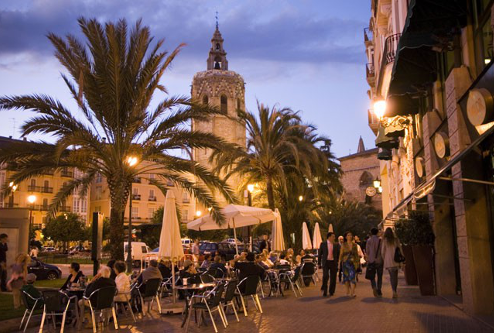 I didn’t realize they have a language called Valenciano, I had never heard about the Fallas, and I didn’t know about the “Turia” – a former river turned into a park that stretches across the city, which would later become my favorite place to walk the dog, run, and even date. While I lived on Josephs couch, I began to look for an apartment of my own. I had my NIE (the identification number for foreigners) and a bank account already set up from my previous stay in Madrid, so I was able to skip the bureaucracy in Valencia and start with the house hunting right away. There was no WiFi at the place I was staying, but luckily most of the cafes in the neighborhood have one that their customers can use for free.